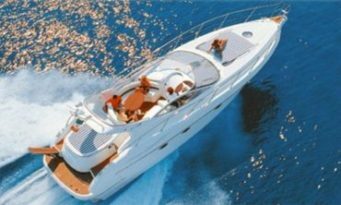 Hamble Powerboat Charters provide skippered charter boat trips on board large, stylish motor cruisers, all at competitive rates. 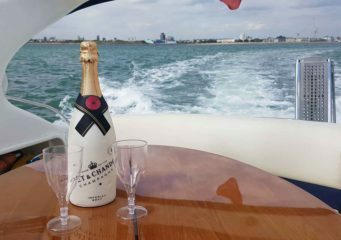 Our boat hire charter packages range from: Charter “taster” experiences, day charter experiences, VIP champagne experiences and overnight stays on board. Charters are on board “Allegro”, “True Colours”, ” or on exciting RIBs. Click for Pricing for Allegro , Pricing for True Colours or Contact us now for more information. Allegro at 13.4m in length has a large entertainment space on deck With her covers down she is perfect for soaking up the sun. 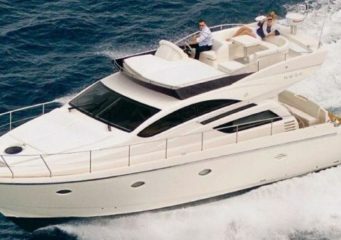 There are two fridges for cold drinks, a large seating area and two sun beds, one on the foredeck and one on the stern. Below deck is a luxury galley and saloon with cream leather seating, two bathrooms and two large bedrooms. 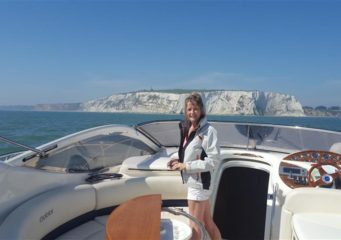 Day charters offer a full day on board Allegro and the opportunity to go further afield and visit Isle of Wight ports and marinas such as Bembridge, Yarmouth or Beaulieu. Or popular “trending” restaurants such as “The Hut” at Colwell Bay. Where we anchor in the bay and guests go ashore by RIB. Day charters begin at 10:00 AM, include a stop for lunch and sightseeing. With time to relax on board before returning to Port at around 6:00 PM. * Fuel inclusive for approx. 50 mile return trips to all popular destinations. 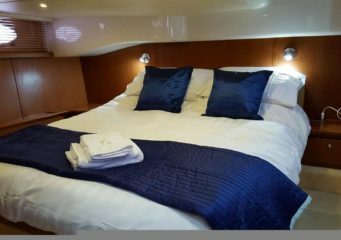 We can also accommodate up to four guests overnight on board Allegro when you will enjoy the whole boat to yourselves. All our vessels are licensed for commercial operation, fully insured and crewed by qualified crew. For more photos have a look at “The Fleet” and our “Gallery” page. Contact us now for more information and to check availability. Day charters on board True Colours offer a luxury refined experience. She is an exceptionally well appointed flybridge motor cruiser with plenty of indoor saloon space, fully insulated from the weather, as well as a large flybridge outdoor entertaining space. 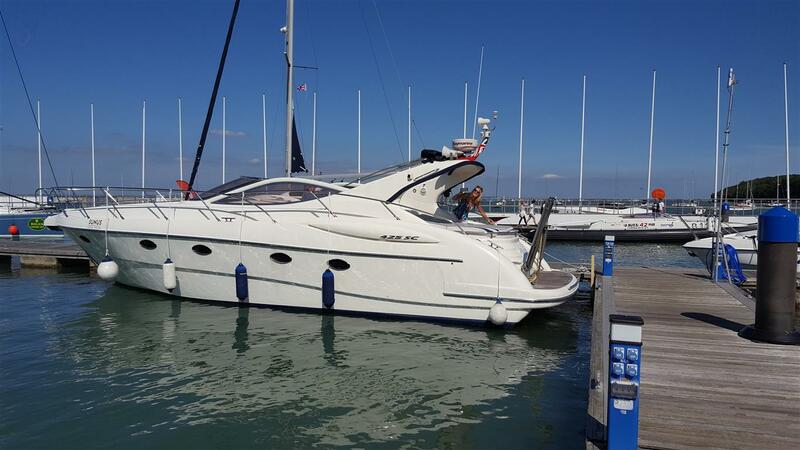 Day charters are a full day on board and include a Solent cruise to idylic locations such as Osborne Bay and marinas at Cowes Isle of Wight. Guests can enjoy lunch ashore with time for sightseeing ashore and relaxing on board. With spectacular events going on throughout the season there is always plenty to see. Day skippered charters on board True Colours are offered in conjunction with one of the UK’s premier maritime training organisations. With highly experienced RYA Instructors as crew on your boat trips. Guests can also pre-book RYA training and refresher courses as part of their trip if they wish. * Fuel inclusive for approx. 50 mile return trips to popular destinations. For more information and photos have a look at “The Fleet” and our “Gallery” page. Contact us for more information and to check availability. A deposit secures your booking. Our popular charter “taster” experiences are an inexpensive way to try out a charter boat hire and make a great gift experience. Available to guests throughout the year (subject to availability). Departing from the Hamble river we head out into the Solent and on to Cowes Isle of Wight. For 2019 we are including a stop over at Cowes as part of your “taster” experience. You can then enjoy time ashore for lunch and sightseeing. We won’t put a time limit (within reason) on your time ashore. 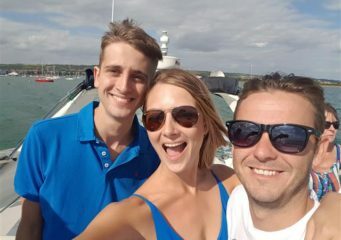 Please note: If you wanted to extend your trip to take in other locations, visit other IOW ports such as Bembridge or Yarmouth or other venues such as “The Hut” Restaurant you would need to choose from our full day charter options. We will occasionally run special Cowes trips and Hamble River and Southampton Water cruises. These will be for short periods throughout the season including our annual Hamble Lifeboat Fund Raiser river trips. 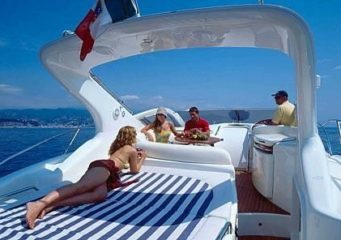 These trips are priced “Per Person” unlike our normal charters. 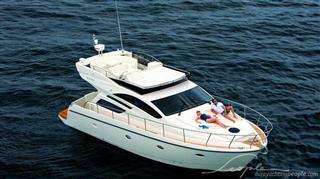 Enjoy time afloat on a short daytime cruise with family and friends. Contact us for dates and lookout for info on Facebook Page. These trips are priced Per Person, minimum 6 max 10 guests per trip. Charter customers also have the option to extend their charter with an overnight stay on board Allegro at fantastic locations . 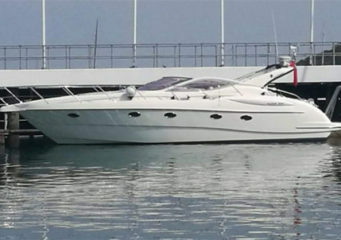 Exclusive use of the whole boat, sleeping in one or both of the en suite double cabins. All linen, towels and soaps on board plus use of the berth holders luxury facilities. A complimentary bottle of wine (or non-alcoholic sparkling fruit drinks) . Two guests whole boat sleeping in one double cabin: 205.00 weekdays. 225.00 weekends per night. discounts for 2nd night. 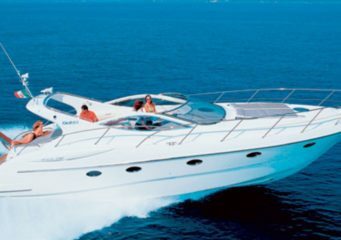 Four guests whole boat sleeping in two double cabins : 295.00 weekdays 325.00 weekends, per night. Discount for 2nd night. Contact us now, to reserve a date and book direct via our Shop. Special offers are available for guests who stay on board as part of a combined charter and overnight stay experience. With exclusive use of the whole boat you can enjoy a luxurious night on board, or combine it with a charter boat rip for a truly memorable experience. (see gallery). All linen, towels and soaps, plus use of the berth holders luxury facilities. Exclusive use of the whole boat, sleeping in the master double cabin with en suite and one or both of the twin bed cabins served by her second guest bathroom. A breakfast of croissants, coffee, tea, orange juice. For up to six guests in her three cabins. Contact us now, to reserve a date and book direct via our Shop. Special offers are available for guests who stay on board as part of a combined charter and overnight stay experience. You can also book your overnight stays only, through our partner at Beds on Board where we already have a 5 star rating. Our extensive knowledge of local restaurants means we can recommend and pre-book guests at the best venues at our cruising locations. Fully inclusive VIP gourmet break for 4 guests. Your experience begins with champagne and canapes on board Allegro upon arrival during the afternoon. You will then have time to settle in on board before your pre-booked inclusive evening meal in a fabulous waterside restaurant. You will then enjoy an overnight stay on board and continental breakfast to start the next day. Your two crew and dedicated hostess will arrive in the morning to prepare for your daytime cruise. As we get underway and pass through the marina lock gate we will pass the Roman castle of Porchester and head south through Portsmouth Harbour, past the historic dockyards and ships and the Spinnaker Tower before heading out into the Solent. You will be served chilled wine as we cruise to our planned stopover for an inclusive lunch ashore, at a pre-booked restaurant. 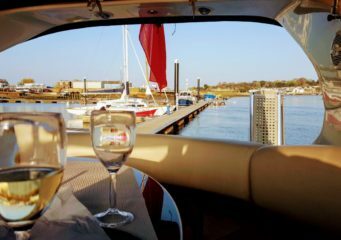 Lunch destinations on our boat trips include Cowes, Bembridge or Yarmouth on the Isle of Wight or alternatively lunch can be taken at picturesque Hamble-le-rice on the Hamble River or Historic Bucklers Hard on the Beaulieu River. Additional nights are available and the package is available during prestigious Cowes Week. 1595.00 weekdays to 1795.00 weekends / bank holidays.